This article first appeared in The Edge Financial Daily, on January 16, 2018. Ford’s ST edition of the Edge SUV is a sign of the times. 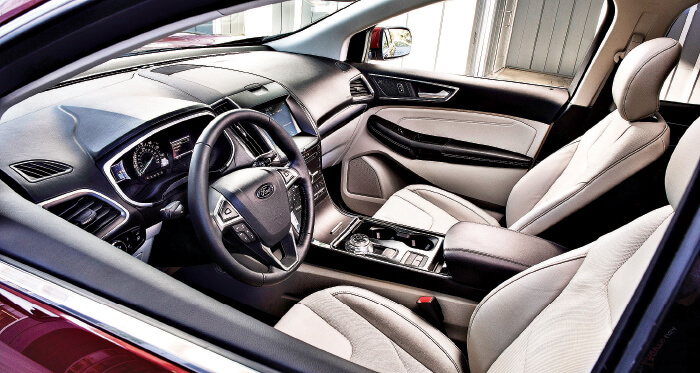 A view of the interior of the Ford Edge. The SUV’s designer is not worried about turning off traditional buyers with the Ford Edge’s racing touches. FORD Motor Co has long souped up its sedans to satisfy customers looking for high performance. Car demand is waning now but the need for speed isn’t, so the automaker is rolling out a fresh hot rod that’s a sign of the times: its first race-ready sport utility vehicle (SUV). The sports technology (ST) edition of the Edge SUV that Ford introduced last Thursday in advance of the Detroit auto show is powered by a 335-horsepower twin-turbo V-6 engine, engineered on the track and styled to look “sinister”, said its designer Steve Gilmore. “We shredded a lot of race tracks with this vehicle,” Jonathan Crocker, the Edge’s chief engineer, told reporters ahead of the reveal. If the idea of doing hot laps in the family hauler seems slightly absurd, welcome to the latest twist in the SUV craze. As US car buyers continue their mass migration into utility vehicles, some are bringing along their preference for performance once sated by Taurus SHO sport sedans and Focus ST hot hatches. Now Ford, better known for muscling up its Mustang pony car, sees a new way to sell more high-profit SUVs. Fiat Chrysler Automobiles NV has already blazed the trail with Street & Racing Technology (SRT) and Road/Track (R/T) editions of its Dodge Durango large SUV and a Jeep Grand Cherokee that comes in a high-performance SRT package or a Trackhawk edition with a monstrous Hemi V-8 engine. About 18% of Durango SUVs registered last year through October were SRT and R/T models, according to IHS Markit data. An understated midsized people mover, the Edge may seem an unlikely place for Ford to start spicing up its SUV line. It attracts the largest female following among Ford’s SUVs, with nearly half bought by women, the company said. Its primary competitor has been the smoothly styled Nissan Murano. But the Edge was in line for a styling facelift after a complete makeover a couple of years ago. So Ford decided to ditch the SUV’s relatively tame Sport edition and give it the full ST treatment. “We sold over 140,000 Edges last year, a fair portion of those were Edge Sports, but this really takes that to another level,” Nair said. Besides its track-tested suspension and race-ready seats, the Edge ST’s looks take a dark turn, with a honeycomb black gloss grill and matching 21-inch shiny black rims with big red brake calipers peeking through. The SUV’s designer is not worried about turning off traditional buyers with the racing touches. “The female buyers are asking, ‘Make it more aggressive, so I will feel more confident in this vehicle,”’ Gilmore said. The engineers also had to overcome a challenge not associated with low-slug sedans — top-heavy SUVs have a tendency to tip over if they fly through a corner too fast. 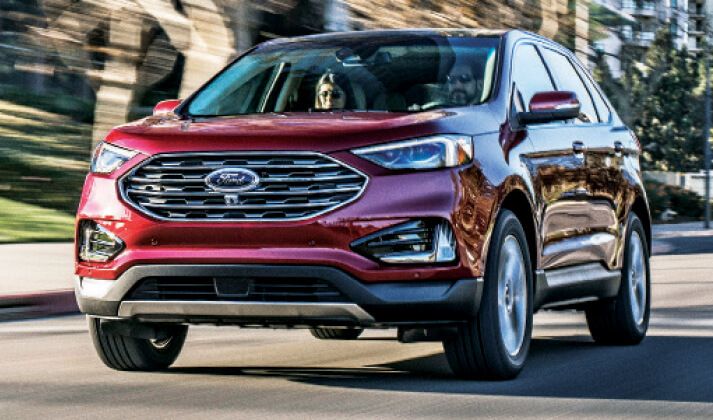 Ford tuned the Edge ST to compensate for its high ride by “managing the all-wheel drive system and electronically creating a little bit of sportiness without getting ourselves into any issues on the centre of gravity,” Nair said. The Edge ST goes on sale this summer, but Ford hasn’t revealed its price yet. The Edge Sport it replaces starts at US$40,675 (RM160,890) and Cox’s Brauer expects Ford to cash in on the upgrades.